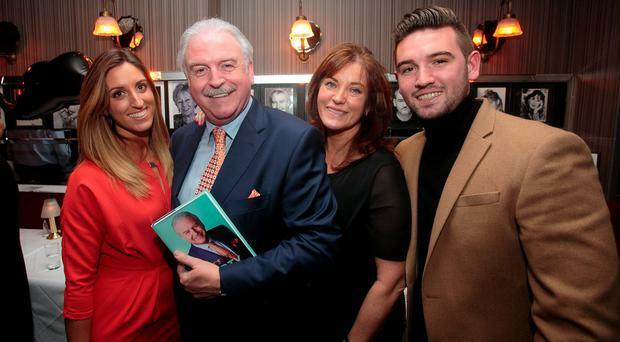 IT WAS both a full house and an Open House reunion at the launch of Marty Whelan’s book, 'That’s Life'. Whelan’s former day time co-host Mary Kennedy officially launched the book in Dublin’s Trocadero restaurant. Morah Ryan, Gate Theatre director Michael Colgan, producer Bill Hughes, Winning Streak’s Sinead Kennedy and Gerald Kean were all on hand to raise a toast to Whelan. “It’s a very emotional night,” Whelan told the Herald. “To have all these friends from various stages of my life gathered here means a lot. “This book is not a tell-all book, just a memoir of my life,” he added. During the course of the night, Whelan recounted the highs and lows of the Eurovision Song Contest, discussed his stint at Century Radio and chatted about his signature facial hair. “My moustache is my crowning glory,” he said. Instead of following a traditional chronological order, Whelan explores themes of love and friendship by revisiting the music of David Bowie, Paul McCartney and The Three Degrees. Asked what he plans on doing now he has finished writing his book Whelan said he would love to front a travel show. “I would love to go around Italy, eating the food and of course drinking the wine,” he said. Whelan has been working in show business for several decades and says “mixing things up” keeps life interesting. Whelan admitted this week that he had been propositioned many times over the years, but added such a fate was “inevitable” given his long career.